Last night (and again tonight), I played Counter-Strike for the first time in a decade. I’m not one of the players that can tell you the ins and outs of how this balance change or that gun or whatever else over the years has ruined the game forever, so all I can say is – it felt really good. The most striking part of the experience for me is looking at the top-down layouts on each loading screen. They’re so simple – simple as they ever were, but glaringly so when held up against the modern standard of super dense clutter-based shooters or the sprawl of massive multi-modal maps (including my own work on Starhawk’s multiplayer levels). There’s an elegance and intimacy in this era of level design that still has a place today amid higher-resolution graphics and higher detail meshes – maybe more of a place than ever as we get ready to move into a new console hardware generation and the inevitable “ooh, shiny!” effect. 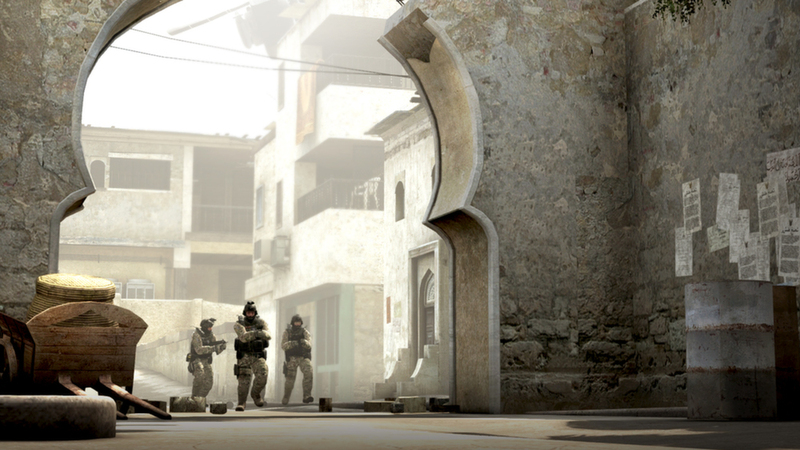 This entry was posted in Gaming, Level Design and tagged counter-strike, nostalgia, pc, valve on August 22, 2012 by Andrew Weldon. As I’m typing this update, Valve’s Perpetual Testing Initiative DLC for Portal 2 is downloading via Steam. This update brings a slick and simplified level editor to Portal 2 along with Steam Workshop support to easily share and find other puzzles online – the first chambers are already beginning to show up! Over at MapCore, we’re kicking off the Perpetual Testing Challenge in which designers will have about two weeks to create 1-3 Portal 2 test chambers using only the new editor. In addition to being a great quick and timely challenge (that also buys us some time to prepare for the next more technical challenge), it also provides as level playing field as we’ll probably ever get. This entry was posted in Level Design, Modding and tagged pc, portal 2, steam, valve on May 8, 2012 by Andrew Weldon. Back at E3, Valve’s Gabe Newell made a surprise appearance in the Sony conference to announce that Portal 2 would be hitting the PS3 with Steamworks support. The big news today is that Portal 2 on the PS3 will allow users to link their PSN accounts to their Steam IDs, unlocking cross-platform play/chat as well as the Steam Play version for PC/Mac. In this household, at least, this dramatically changes the status quo. Since the start of this console cycle, I’ve used the 360 as my platform of choice for multi-platform titles while buying Valve titles off Steam and reserving the PS3 and Wii for platform exclusives. Now, I can say with certainty that Portal 2 will be my first multi-platform purchase for the PS3, and the PS3 version will likely become my default platform for Valve games if this is the benchmark for future titles. While I’m a huge fan of Valve and Steam and I consider this a massive victory for the multi-platform gamer, another part of me is still left feeling a little uneasy. As great as Steam is, there’s one demographic that I believe finds it a little bit lacking in comparison to platforms like Xbox Live or the PlayStation Network – gamers with families. This entry was posted in Gaming and tagged pc, portal 2, ps3, steam, valve on January 18, 2011 by Andrew Weldon.